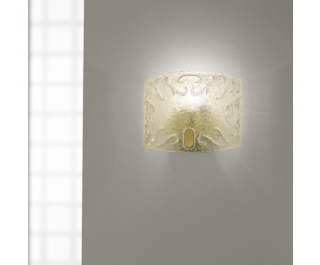 The Dogi long wall/ceiling sconce by Vistosi has been designed by Studio Tecnico Vetreria Vistosi 2002. This crystal is blown design is made in "piastra" glass with "granglia" textured surface decoration over a clear crystal diffuser. It is offered in two different wattage styles for your illumination preferences. This beautiful light was handcrafted on the island of Murano.